All of us at Wooden Spools wish you and yours a very happy and healthy 2017! As the year begins, we start again at the beginning of the alphabet! Here are the ABC’s for the first 2 weeks! From January 2nd thru 15th…. 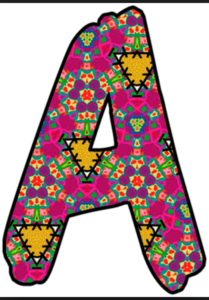 A is All About Amazingly Awesome customers – like YOU! Let’s celebrate what you have done! Bring in a show ‘n tell item that you’ve done with resources from Wooden Spools and we’ll DOUBLE your Show ‘n Tell Discount! B …. Bring in your Show ‘n Tell! We get to start the year with loads of inspiration from you. Yay! Although it won’t be the same since Jessica moved away, the “Bonnies” will be gathering to sew together and to share their love of Bonnie Hunter quilts and patterns. That is all that’s necessary to be a member of the club! These are not classes – but rather a monthly gathering with others who love what you love! Share tips and tricks – and usually some yummy snacks too! Click on the letter A above to read this week’s entire newsletter! ← 2017 Follow Along With Phyllis: Starts Jan 28th!